Giri Raj Baskota / Republica A glimpse of the one-day yak festival organized at Charrate of Falelung Rural Municipality, on Saturday. PANCHTHAR, April 16: It is situated at an altitude of 3,340 meters from the sea level. Herds of yak were moving in a relaxed manner. They would become invisible the very next moment, thanks to the fogs suddenly that turns thick any minute. Hundreds of tourists thrilled with the fog and the scenery were also capturing rhododendrons blooming around. Tourists, most of them from India, exclaimed that such a magificent view is only found here, in Nepal. 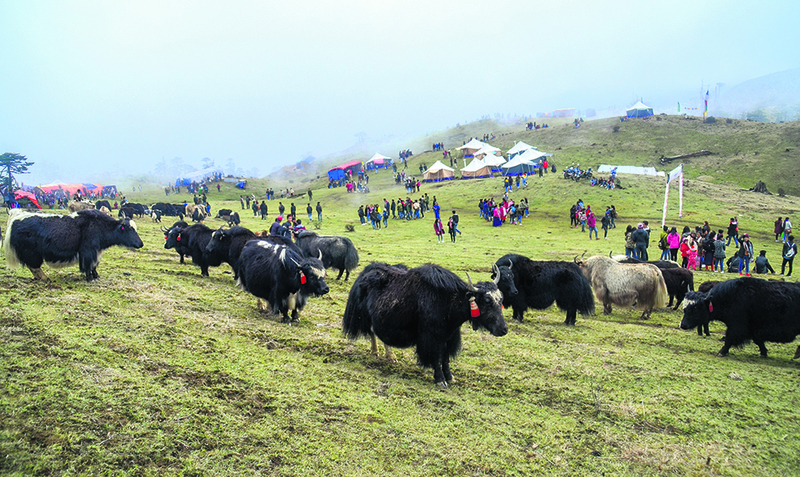 It was a glimpse of one-day yak festival organized at Charrate of Falelung Rural Municipality on Saturday. The third yak festival had drawn a considerable number of Indian tourists as the venue lies near the Nepal-Indo border. 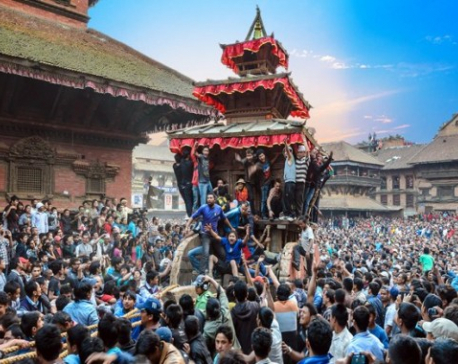 Organized by the Rural Municipality itself in association with Nepal Tourism Board and several other local bodies’ the festival aims to promote eco-tourism, conserve wildlife and nature and boost cross tourism. provincial government highly regards the significance of the festival and is committed to making it even grand in the days to come. “Our place is wonderful, within a very small area of land we have diverse varieties of climate. We have an equally diverse species of animals and flora and fauna. Yak are one of these,” he remarked. “Our farmers who were otherwise rather quitting goat farming are now gradually getting encouraged. We want to promote tourism, agriculture, culture, wildlife through such events,” he added. Angbo further informed that the provincial government had allocated Rs 1.5 million for the conservation of yak. In the coming years, the budget for the program will be increased based on the needs assessment. For the festival, yak were brought from several areas of Taplejung and Panchthar. Stalls of milk products of yak attracted huge crowds. Domestic tourists from Jhapa, Panchthar, Taplejung and Ilam had added to the thrill. Participants from China and Bhutan looked no less excited. Unlike other seasons, hotels near Sandakpur and Aahal were all full of visitors. Temporary or mobile eateries were equally crowded. “Look at the location, the topography here. It’s challenging to reach this point due to the lack of roads. Yet, so many guests, visitors, tourists have come here. This is amazing,” Angbo noted. Shepherds and owners of the yak had reached the venue one or two days before the event. Another attraction of the festival for the tourists were yak rides along with horse races. Adding to the excitement were the deliciously cooked authentic local cuisines, folk music and dances of Nepal and India. The visitors to the event belonged to all group of ages and all walks of life. Many had let the world know of the excitement by streaming the events on their social media channels. Former lawmaker Bishmaraj Angdembe, however, lamented the lack of promotion of the event before the date. Had the organizers well promoted the event, the number of visitors would have been much more, he said. “This is an amazing festival. It is a lifetime experience. People would have come here from several countries had they been informed on time. From next time, the government, the organizers should make much better preparation to advertise the festival,” he said. He added that the festival has however established itself as a brand and will greater fame in the days to come. Professional goat farming is conventional in Falelung, Yangwarak, Sidingwa, Shreejangha, Faktanglung and Mikwakhola, among other villages of Taplejung and Panchthar. But compared to the past, fewer households are into this profession nowadays. According to locals, new generations are not much interested in the ‘tough job’. Organizers claim that the festival as well as other incentives and packages offered by the government for agriculture will not only revive ‘yak culture’ in the region but will make it even more popular in the high hills.